Le Jardin Noir – France’s very own Arkham Asylum falls under siege! 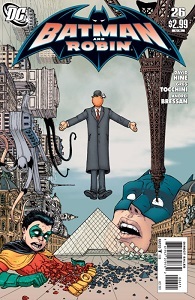 Someone has freed the lunatics, and unless they can be stopped, they’ll turn Paris into a surreal Hell on Earth! Batman and Robin join Nightrunner in a mind-bending battle with the strangest lineup of villains this side of Bizarro World. How is that appropriate? The term “lunatic” is not medically sound and it implied that all people considered to have a mental disorder ought to be locked up or else they will turn the city into Hell. Harsh. Often, villains are considered to be crazy, psychotic. The terms are used interchangeably even though psychotic disorder has certain requirements to be diagnosed as such. The looseness of medical language in comics is problematic. But even more so, is the lack of role models and heroes addressing this serious matter. One of the novels that does address mental disorders is Watchmen. Almost every character exhibits some characteristics of a medical disorder. This has already been examined in other articles so I will focus on two characters- Rorschach and Ozymandias, who both try to save the world, but through completely different means. Rorschach may be paranoid; the jail’s psychiatrist’s notes even consider trying to label him with a new syndrome that could be applied to other vigilantes. He is vulgar, violent, and pursues what appears to be right to him- namely strict punishment, including death, to criminals, but only criminals. Ozymandias is more cultured, more crafty, and also attempts to do right- by releasing a monster and destroying half the city to try and force mutual cooperation between the world powers. It may be commendable to try and prevent another world war, but Ozymandias shows signs of narcissism, particularly a lack of empathy and disregard for other’s lives. Another book that looks at mental disorder, without the addition of heroes or vigilantes, is Swallow Me Whole by Nate Powell. This novel explores the affects of schizophrenia, coupled with the troubles of teenage life. The protagonist deals with the anxieties of everyday life, not the seedy underworld, not sci-fi monsters, but the peer pressure, drugs, and family trials of everyday life. It also makes use of the art, as well as the text, to demonstrate the trauma of schizophrenia. For these reasons, it is a more accurate depiction of mental illness and should be read for the insights it presents. It’s really neat how you pointed out the opportunity comics have to increase awareness and information on mental illness. I think, though, that Arkham Asylum isn’t as bad as it seems. The Asylum has appeared in Batman comics since the 70’s and, from what I can tell, is depicted as an asylum for the “criminally” insane”: holding many of Batman’s enemies who have been legally diagnosed with mental disorders (the enemies without mental illnesses are held somewhere else). That said, Batman has a lot of new fans and without that background info, the title comes across really harsh and offensive. With such a wide-growing audience with people approaching the series for the first time all the time, “Someone has freed the ‘criminals'” might’ve been better suited.